The 2019 Ford EcoSport exists to make life easier for its occupants. To this end, it includes many interior tools and technologies that work seamlessly by voice activation. The 2019 EcoSport takes this system a step further by joining forces with the Alexa system. Drivers need only say “Alexa” after which they can issue commands or make requests. This system not only makes things more convenient for vehicle occupants but can also improve safety. 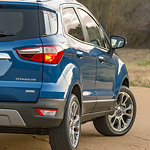 Another safety improving technology included in the EcoSport is the Blind Spot Information System. Most blind spot systems work by providing drivers with views of the rear areas of their vehicles. While the Ford EcoSport system provides this service, it also goes much further by offering a specialized Cross Traffic Alert system. This technology employs radars to find objects or vehicles in driver's blind spots and also in other areas around the vehicle. If it detects danger, it gives drivers both visual and audio alerts that allow them to avoid hazards.